Does Jules B have retail stores? Does Jules B ship to Post Office boxes or Freight Forwarding addresses? What payment methods does Jules B accept? Do I need to set up an account with Jules B to place an order? Does Jules B have seasonal sales? How do I sign up for a Jules B newsletter? Yes, we have stores throughout the north of England. Our main stores are in Newcastle-upon-Tyne, Kendal and Yarm. Our main offices are based in Newcastle-upon-Tyne. Yes, Jules B only stock 100% genuine designer brands. You can email any queries you have about your order or products on the website to customercare@julesb.co.uk. Our operations team go through all customer emails and forward them to the relevant departments who will answer your queries directly back to you. If you have a press inquiry you can email the press department directly at haley@julesb.co.uk. We work in partnership with FedEx International, one of the largest international courier companies offering an unbeatable service both in delivering your package and customer service. UAE delivery is 139.99AED and if you place your order by 2pm it usually takes up to 2 to 4 working days but during busy periods it can take longer. All of our garments are sent out wrapped in signature Jules B tissue paper and in branded Jules B boxes which are protected with FedEx packaging. Due to international trading agreements and regulations, Jules B is obliged to adhere to particular shipping restrictions. Occasionally designers will place restrictions on the countries we are allowed to ship their stock to. This will always be clearly stated on the product page. Yes, all items are insured against theft and accidental damage whilst in transit from Jules B to the shipping address. Once your items have been delivered to the specified delivery address and signed for, they are no longer covered by insurance. Upon dispatch of your order FedEx will email you a tracking email so you are able to check your order status and be kept up to date with your consignment. Don't worry. If you are not in when FedEx try to deliver your parcel, a card will be left giving you the option to re-arrange collection. They will re-attempt to deliver your parcel up to three times. Jules B Ltd accepts major credit and debit cards including Visa, MasterCard, Maestro and Delta through our payment service provider Barclays. All credit card details are secured with 128-bit encrypted sessions and all sensitive information is stored on a heavily encrypted database that is protected by multiple government approved firewalls. We also accept payment by PayPal. Here at Jules B, your personal online security is important to us. We use the latest SSL encryption technology to store and safely transmit your personal and credit card information through our systems. All orders are processed through a secure checkout system provided by Datacash Ltd.
Jules B Ltd complies with all aspects of the Data Protection Act of 1984 and the new act of 1998 and as such are registered with the Data Protection Commissioner. We do not disclose details of our customers to any third party. You may also choose to securely store your credit card details with us. This means you will not have to enter them again during future purchases, making it quicker and simpler to shop at Jules B. You can select which country you view our products in by using the drop down menu on the right hand side of the site. It is important to note that you may have to pay custom duties and taxes on the items you purchase and that these local fees are not included in your Jules B invoice. Please check the FedEx website for more information about international charges if you are unsure. For all other duties please contact your local FedEx depo with details about your potential order and they will be able to assist. Yes, you must create an account in order to make a purchase from the Jules B website. This can be done, by filling in a simple form at the checkout. If for some reason you are unable to log into your account, our phone number and email address can be found on the contact page. We aim to get back to you in...... You can also use the live chat feature, found in the bottom right hand side of the screen. To register at Jules B, we will need to know your name, mailing address and email address. When processing your order online we require your billing address, shipping address, telephone number, credit card number and expiration date. If necessary, these details may be shared with a credit reference agency to verify your order. Using the online Jules B shop is easy; If you know what you are looking for, use the top navigation links or advanced search bar, then choose to shop by category or brand. As well as that, our team of Fashion Advisors tries on every item we stock, and can answer all your questions on sizing and fit - just email customercare@julesb.co.uk if you have any further questions. All items are in stock unless an 'out of stock' message is displayed. Yes we have sales twice a year. 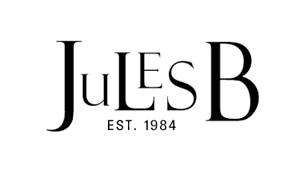 To be notified of any sales and in store/online promotions sign up for our Jules B newsletter so you don't miss out! Simply enter your email address in the footer box found on any of our pages and click to sign up.